Part of the “Smart Fun” series of activity books, these books are widely used in schools, homes, and summer camps. The games in this book are designed for children age 6 through high school and are an ideal way to enhance creativity and imagination. Each game includes an age guideline (grades K-2, 3-5, 6-8, 9-12, or all grades) as well as an indication of whether the game is for an individual, pair, small group, or large group. An additional icon shows the estimated time of play, so selecting an appropriate game for your situation is quick and easy. Games are divided into such categories as improvisation, metamorphosis games, mirror games, trust games, and energy games. Read more...Flexible enough for use in a variety of settings, most games require no props. 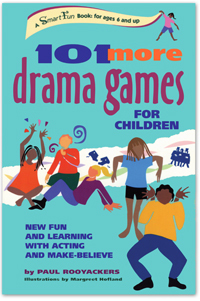 These games require no acting skill — just an active imagination!